Chinese steamed custard buns also called Nai Wong Bao are deliciously sweet dessert. A popular Asian treat found at Dim Sum restaurants, but I’m going to show you how to make these right at home! Growing up in the San Francisco Bay Area, my family and I would have dim sum at least once a week at our favorite Chinatown teahouse. It was exciting to see the servers push shiny silver steam carts filled with goodies around to each table. The pushcarts are loaded with different types of a la carte items like steamed dumplings, rice noodles with seafood or meat, chicken feet, sticky rice, and sweets. I don’t speak Cantonese fluently, but I began to learn quickly how to order my favorite foods at Chinese restaurants. Even to this day, I anticipate the steam cart that brings my favorite dim sum treat; Nai Wong Bao or steamed custard buns! This is my absolute favorite comfort food, and I am delighted to share this bun recipe with you. To make homemade custard steamed buns is a labor of love, but well worth the time and effort! I recommend making the dough in the morning so that you can enjoy dessert after dinner. The dough is made with yeast, so time is needed to allow for the fermentation process or “proof” several times at various preparation stages. When the dough has completed the fermentation steps, it’s ready for shaping into buns! This method is called, “dough breaking,” you use your hand to separate each piece instead of a knife because it will be easier to shape back into round dough balls. Once each piece of dough is separated, they’re rolled into balls, flattened, and rolled out to be large enough for adding the delicious custard filling. You can also make these buns into sliders by adding your own favorite fillings after you slice them! A generous tablespoon of custard filling is placed in the center of each dough round. The custard should be scoopable (not runny) and hold shape so that it is easier to handle the bun once filled. With the filling added, begin to pleat the edges of the bun, slightly stretching the corners of the dough to meet another side and pinch them together. As you fold the dough with your right hand, you are simultaneously twisting the buns with the left hand, resulting in a tightly encased ball. The seam of the custard filled bun is placed on the bottom, so the surface is nice and smooth when steaming. You can also keep the beautiful twisted seam side up when cooking for a similar look as my char siu bao recipe, a savory bun made with pork filling. Whenever we would go to the tea house for dim sum, I would always tell whoever was closest to the server to ask if they had “the custard buns.” I knew they were the right ones when they arrived with a small red dot in the center of the pastry. For authenticity and to bring back childhood memories I used food coloring and a small round stamp to create the red dot on the custard buns after they were steamed. These heavenly pastries are so delicious that I always have to bring a pink box filled with more Nai Wong Bao home when I visit Chinese bakeries. When I make these buns at home, I can tell you that they don’t last very long! This Chinese steamed custard bun recipe turns out soft, tender, and just the right amount of sweetness. Your sweet tooth will be undeniably satisfied after eating this soul-satisfying treat! 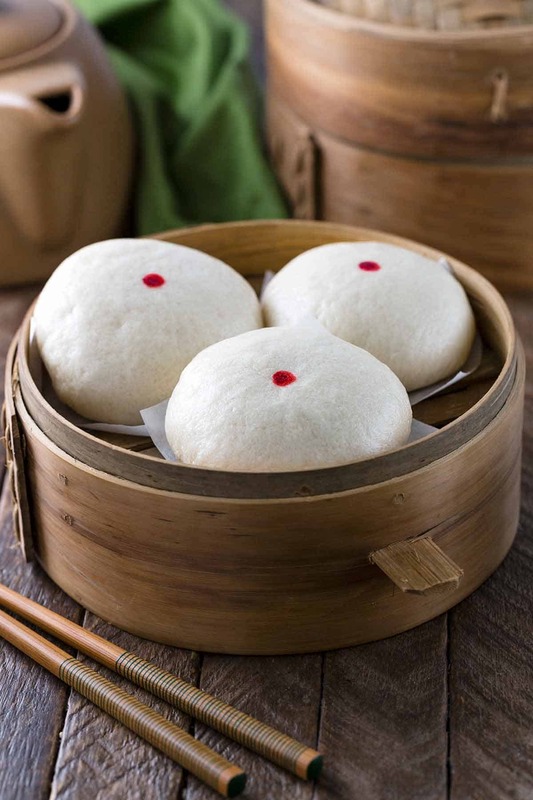 Steamed custard buns are made with yeast dough. Fermentation of sugar in the dough by the yeast called Saccharomyces cerevisiae helps the dough to rise. Yeast can be killed at temperatures above 138°F (43°C), so make sure not to add water or milk hotter than directed during fermentation. This a long process, however, the result is worth the wait! Chinese steamed custard buns are soft, tender and have just the right amount of sweetness. A popular dessert found at Dim Sum restaurants made right at home! Add the milk and cream in a medium-size saucepan. Bring to a simmer over medium heat. Whisk in 1⁄4 cup sugar, until dissolved and then turn off the heat. In a medium-size bowl, whisk together the egg yolks and 1⁄4 cup sugar until smooth. Add the cornstarch to the egg mixture, and whisk until incorporated. Remove the simmering milk mixture from the heat. Measure a 1⁄4 cup of the milk mixture, then gradually add it to the egg mixture, whisking constantly to temper. Gradually add the tempered egg mixture to the remaining milk mixture, whisking constantly. Place the sauce pan on the stove, heat over medium-high heat. Whisk constantly until the mixture slightly thickens, 3 minutes. Turn off the heat and remove the saucepan from the stove. Whisk in the cold butter and vanilla until incorporated. Cover with plastic wrap and refrigerate until chilled and set, at least 2 hours. The custard can be made a day in advance. Dissolve sugar in warm water, sprinkle yeast over. Let stand 2-3 minutes and then stir to mix well. Let set until it starts to foam, 10 minutes. Sift flour and make well in the center. Whisk together the shortening, sugar, yeast mixture, and milk. The fat will not completely dissolve into the liquid. In a large mixing bowl combine liquid mixture with the flour. Gradually incorporate the liquid into the flour to make the dough. Knead the dough for 10 minutes, sprinkling with flour as necessary. Use the oil to grease the outside of the dough; cover and let rest in warm area 1 ½ hours or until double in size. Punch dough down and flatten out to about ¾ inch thick. In a small bowl mix together the baking powder and cold water. Spread the baking powder mixture evenly on the dough (this acts as a stabilizer). Roll dough up and knead about 10 minutes, or until smooth and satiny. The dough should be firmer than regular white bread dough. Cover and let rest 30 minutes. Divide the dough into four equal parts. Roll one part by hand to form a rope approximately 9 inches long and 1¼ inch in diameter. Mark into 6 equal parts, 1 ½ inch long. Holding the dough with one hand, grip at the first mark with the thumb and index finger of the other hand and tear away briskly to break off a small dough piece. Continue breaking until you have 24 pieces. Flatten each piece of dough with your palm. Using a rolling pin, roll each into a round disk, making quarter turn with each roll. Roll to leave the center thick; thinner edges are easier to pleat. Place about 1 tablespoon of filling in the center of each dough round, flat side up. Gather the edges by first pleating counterclockwise, and then twisting to seal securely. Place the bun round side up on a square piece of parchment paper (2.5 X 2.5 inches). Let buns rest, covered for at least 30 minutes. Prepare the steamer by adding enough water to cover the bottom of the steamer, about 1 inch in depth. The water should not be touching the bottom of the steamer insert. Cover the pot and bring to a boil. If a flat lid is used to cover the steamer, wrap the lid in a kitchen towel to prevent condensed steam from dripping on the buns. Add the first batch of buns in the steamer. Cover and steam on medium-high heat for 5 to 6 minutes. Do not uncover the steamer during the cooking process. Turn off the steam before opening the lid, remove buns with tongs and then add the next batch of buns. Repeat the steaming process until all of the buns are cooked. Buns can be refrigerated in a resealable plastic bag for up to 3 days. Reheat the buns in the microwave until softened, 15 to 20 seconds. i’d love to try these! they look labor intensive but worth it! Hi Dina- It will be worth the time 🙂 I always freeze some so I can have them when ever I want! Hi! Do you freeze them before or after steaming? how long are the buns good for in the freezer would you guess? About a month individually wrapped in plastic and then stored in a resealable bag. Hi Chelle! Let me know if you have any questions, I would love to help if you ever decide to make them! These look fabulous! I am going to make an attempt! How long can you let them sit before steaming them? I am hoping to make them in the morning for steaming in the evening. Or is it better to make them the day before, freeze them and then serve the next evening? If frozen, how long should they be steamed? Can’t wait! Hi Sandy- Yay! So excited for you to try the recipe, they are my favorite! You can let the formed buns sit at room temperature for 1 to 1.5 hours. If you plan to steam them later in the evening, refrigerate them covered with plastic wrap. Take them out about 1 hour before steaming, allow them to come to room temperature, then steam. You could also steam them the day before, allow to cool, refrigerate in a plastic bag, then microwave for about 15 seconds to reheat, or re-steam before serving. Check out my “steamed pork bun recipe” for a quick step by step video on bun making. Please let me know if you have any questions, I would love to help! I made the buns this weekend and they turned out fabulous…I received MANY compliments. Also, it was a lot of fun to make. The only part I got stumped on was the custard…I didn’t realize that I had to let it thicken so much over the stove (for some reason I thought most of the thickening/ firming would happen when it cooled)…but I tried a second batch with more time on the stove and it came out perfect! I also did a batch with red bean and that came out nice too! Thank you! Madam kindly please teach me. Nobody explain that point. Thank you ahead ,madam! Do you use butter or lard? That make help keep the bao white in color, and kneading it for a long time. Hi Sandy! It’s so wonderful to hear that you had success and had fun! The custard was a challenge for me as well when I was developing the recipe, but the thicker texture is the goal as its cooking to make it easier to fill the bun. I have also heard success from others who had a runnier filling, and by reheating the custard until it thickens also worked 🙂 The cornstarch needs to be heated until almost boiling so it gets the chance to swell and thicken the liquid, and stirred to prevent scorching and over lumping. Thank you for being brave to try the recipe, and not giving up! The sweet red bean filling sounds amazing, I love using these buns for sliders too! I’ve been looking for a recipe for these steamed custard buns for years! And it looks like you’ve made some adjustments (from your previous recipe). I just made the filling and am so excited to make these buns, along with steamed pork buns and red bean paste buns. Hi Karen! I’m so happy to hear that you are trying the recipe! I can’t wait to hear how it turns out and any feedback you may have. I created the other custard filling recipe a few years ago, so I retested the recipe and made some adjustments that hopefully helped. Happy steaming! Can you use a different custard powder? Hi Sondra! The flavor may taste slightly different, however if the powder contains egg yolks, sugar, milk powder and cornstarch, I think you will be okay. I would suggest making small test batches so you can play around with the flavor and texture, starting with the same input as recommended in the recipe, then adjusting from there if needed. Is there a brand or particular product you have found? These are my husband’s favourite & I look forward to trying them. Just wanted to ask if I can substitute the lard/shortening for butter? Would it be a 1:1 ratio? I live in Australia where it’s hard to get lard. Thanks! Hi Winnie! Does your local market sell crisco? That would be the shortening I would recommend and it’s usually in the baking section. Otherwise, I would definitely give 1:1 replacement of butter a try! Make sure to let the butter come to room temperature so it is softened and easier to incorporate into the dough. I can’t wait to hear how it turns out! No, Crisco’s not on sale here. 1:1 replacement of butter works well. Buns turned out perfectly. Thanks! Any substitute for custard powder?? When I go to pleat buns to secure filling, the pleats do not hold and appears to look as on big twist as if the dough needs to be kneaded more, or should I add a bit more flour. Taste great, but look of final product is taking me some time to perfect, I used dry active yeast. The first time I made it, the custard become scrambled-egg-like, instead of thick pudding? Eventhough I keep stirring under medium heat. Was it becoz I kinda overcook it under a long time? . Any advice? Oh, and um.. can you take a picture of how ur custard looks like when cooking? It might help me when to stop cooking the custard..! Thank you!! Hi! Please don’t be discouraged, it’s fantastic that you have tried the recipe (which is pretty techinical), it’s always a challenge the first time or two! Here are some tips: 1) Make sure for the first step when you add the beaten eggs to the custard/cornstarch/sugar/milk mixture, the heat is low, so that the eggs don’t cook and look like scrambled eggs. The mixture will still be liquid at this step. 2) Now gradually increase the heat to medium and consistently whisk the entire time (very important! ), which will begin the thickening of the cornstarch. When cooking a custard, the cornstarch helps to thicken the mixture and give the “pudding” consistency. This only happens when the mixture is almost at boiling (100C, you’ll see the liquid begin to bubbly on the surface). This allows the cornstarch to swell and absorb water, then thicken. 3) Once the mixture thickens, you can reduce the heat at this point, continue rapidly whisking and taste as you go. I usually keep stirring and cooking over medium-low to medium heat until I can’t taste the cornstarch (I check the taste every additonal minute after this point). When I can’t taste the cornstarch and the mixture has thickened, I whisk in the butter. 4) With this recipe, the mixture does become lumpy, however keep whisking as you see the mixture thicken, stirring the sides and bottom of the pan to make sure the sides don’t burn and can get incorporated in to the mixture! All of the clumps will not be gone, however it’s important as the mixture cools (either at room temperature or chilled in the refrigerator), that the custard does firm so you can easily scoop and fill the buns. Even though it may be slightly lumpy when cooled, the filling will loosen when the buns are steamed and have a soft and creamy texture. I’m thinking of making a video for the recipe so you can see step by step how to make the custard buns, so stay tuned! I truly appreciate your time and feedback! Alright, thank you so much for replying me! And all these wonderful tips..! I can’t wait to hear how your custard buns turned out! We just made steam buns this morning from your recipe but with sweetened bean paste, So Great! The only part we still need to get right is the pleating and folding, so ours were a little ‘original’ but otherwise they were great! Thanks! I’ve made a similar recipe before the filling didn’t turn out at all, this one looks most like the ones I’ve had in restaurants and would like to try, but I have never heard of or seen custard powder in stores, where can I get it? Hi Shelley! I use the Dr. Oeker Crème Brulee product, which I have purchased at Albertsons. Doing a quick search online, it looks like walmart, wegmens and amazon also sells the product. You will need 160 g of the custard powder for the recipes. Hi Jessica! I’m excited to try making these. I was trying to figure out the conversions for the custard part of the recipe and wondered if you might have an equivalent of the ingredients in cups/tablespoons/teaspoons/etc and the like? thanks in advance! Great question Cindy! I’ve updated the instructions with metric units as well. Please let me know how the recipe turns out for you. Before you start making the custard, check out my comments section at the end of the post. There are a lot of great questions and answers for troubleshooting. Just make sure to continuously stir the custard over medium heat and don’t stop until it thickens! The custard should not be runny, it should be a thick pudding. Good luck! If you love baking, I would highly recommend a digital food scale, your measurements will be much more accurate. I got mine from target and love it! I AM GOING TO try your recipe THIS AFTERNOON. I HAVE MADE CUSTARD FROM SCRATCH MANY TIMES. DO YOU HAVE TO USE CUSTARD POWDER FOR THESE BUNS? Or CAN I JUST USE A STIFF CUSTARD FROM SCRATCH? Hi Marshall! I think you can definitely use a stiff custard from scratch for this recipe. Just let it chill before filling, that will make it much easier to scoop and fill the buns. Looking forward to hearing how your experience goes for making custard buns! I put a spoonful of jam in a few so some were jam & custard buns. ACtually they were quite sweet, so the plain custard buns were better. i used birds custard powder. I will try chocolate spread next time instead of custard, for a change! I put half the buns in the freezer and brought out 1 a day to steam. they were perfect! thank you. Hi Doreen- I’m so glad that you enjoyed the recipe! I’m impressed that you tried different fillings, let me know how the chocolate filled ones turn out! I just tried this sticky bun recipe today on my day off from work. I love this recipe, The preparation takes awhile but so worth the work in the end result. I also tried a filling my boyfriends mom uses. Dehydrated mushrooms, oyster sauce, sugar, sesame oil, three small cooking onions, corn startch. Mix it together leave in the fridge for an hour or two, I like two hours. Then use the custard as well as the mushroom filling. The dough recipe is amazing. Thank you! if i add food coloring to the dough at the end of the kneading process will they be ruined? i love custard buns but they always looked plain to me. i’d like to make them pink! Hi Rebecca! Maybe you can try to add a drop or two to the milk so that it mixes in more evenly and the dough does not get over worked at the end. Let me know how it goes! I made these and they turned out fantastic! Hi Nat- Thank you for trying the recipe, I’m so happy they turned out great for you! hello! i was wondering if i cook it in the steam oven, what’s the temprature for the steam oven to avoid over cooked custard? and can we keep it in the heat to serve it hot? Hi Bonny! I’ve never baked in a steam oven before, does your oven have some manufacturers instructions? It sounds like an interesting technique! I’ve stumbled into your site while browsing for custard bao recipe on Pinterest and I have to say, it’s a success! I used margarine/butter instead of lard/shortening though, and it really works! I’m so proud of you Marcella! Definitely not an easy recipe, but so worthwhile. It’s one of my all time favorites 🙂 Let me know if you have any questions about any other recipes, I would also love to hear your feedback! I just finished eating the buns and they were delicious but I have a question. The dough was very runny and the custard would leak out while the buns would fall apart. I ended up adding a lot more four because they were also very sticky. Not a big problem because I just steamed the buns on parchment paper and added the custard on the side but do you have any idea what happened and how I can get the dough to be firmer and more “manageable” next time? Thanks and looking forward to trying many more of your recipes! Hi Kim! I’m so glad that you got to try a few recipes. The Chinese steamed buns is definitely one of my more challenging recipes, and so happy to hear you liked them! Quick question, was the custard itself runny or thick? I haven’t had the experience of runny dough, more of the opposite where it was thick and stretchy. I think adding more flour as needed is a great idea, I think measurements can vary sometimes depending on how we scoop out the flour and how much moisture it has been exposed to. A few questions; 1) how much water did you add to the baking soda?, 2) How did you measure the flour?, 3) Was the temperature of the milk and water added to the bread 105 degrees or below? Jessica 🙂 I’m making these tonight! Can I bake these? Instead of steaming? How Exciting Adran! I would recommend steaming for the most tender custard buns. 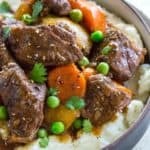 Hello, I’m new and very exited to try this recipe. I was just wondering how you steam them? I was looking for recipes to make Chinese steamed custard buns, yours seems straight forward and easy, i attempt to try it out today or tomorrow. However, may i know what if i’m using instant dry yeast? I happen to have instant dry yeast only at this moment. I’m referring to TIPS #3. Which part of the recipes should i omit? I’m new to baking. Hi Cherry! I’m excited that you want to make the custard buns. I have not tried making the recipe with instant dry yeast, so I have not tested instant dried yeast instead of active dry. Here is what I do know, the liquid used in the recipe activates the yeast, incorporated between 120 to 130°F (49 to 54°C) for most products. After kneading, the dough rests for 10 minutes to relax the gluten in the dough, it is then shaped and allowed to rise until double in size (no need for the first proofing step). Rise time is much faster, usually an hour or less. So for this recipe I would try mixing the sugar, yeast and flour together. Then I would heat the water and milk to 130 F, dissolve the fat in the water and mix with the dough, and knead for 10 minutes and allow to rest for 10 minutes, skipping step 5. Then roll out the dough and add the baking soda mixture. Follow the rest of the directions. Let me know if you use the instant dry yeast instead! I can’t wait to try this! For the custard…. My husband is lactose intolerant, can I substitute lactaid milk and does it have to be whole milk (we use skim)? The lactose intolerant part shouldn’t be an issue for the bun part, same question about using whole milk. Hi Jessica– I took the entire day to make these; it was a fun project! They turned out pretty great. My custard was a little runnier than what yours looks like in the picture so folding the baos was a little challenging! Thanks for the recipe!! Hi Claudia, I think you can substitute coconut cream for the heavy cream for the custard. I would love to make this today but I only have tapioca starch on hand. Do you think this can substitute for the corn starch? Thanks. Hi Caroline- From what I’ve read you can substitute 2 tablespoons of tapioca starch for 1 tablespoon of cornstarch. So double the amount for this recipe. I haven’t tried this, so I’m hoping that it would be too thick. Please let me know how it works! The comments talk about custard powder, but I don’t see that in the list of ingredients. When do you add that and how much? Why do I create a well in my flour if I am adding my flour to my wet ingredients? This is my first time making anything bread-like. Hi Ashley- Great questions! I had an old version that I have updated in the past year, so there is no longer any custard powder in the recipe. I’ve updated the recipe so that the liquid is added to the flour, thank you! Just to double confirm it is Egg yolk Not Salted Egg Yolk? Although it was labour intensive the buns turned out delicious. Question I have is that the steam buns in the restaurants are fluffier than these. The recipe wasn’t clear on how much of the diluted baking powder was I supposed to brush onto/incorporate into the dough. I only brushed generous but did not use half of it. Is that the trick to get fluffy buns? Hi Helen- Thank you for making the recipe! I use all of the baking soda mixture to give it extra rise.